Optic nerve sheath fenestration (ONSF) entails cutting a window or making linear fenestrations in the retrobulbar optic nerve sheath, which releases pressure and often allows stabilization or improvement of vision. Indications for ONSF include visual loss due to pseudotumor cerebri, optic nerve sheath hemorrhage, dural sinus thrombosis, subdural hematoma, intradural arteriovenous malformation, arachnoiditis with increased intracranial pressure, and cryptococcal meningitis with papilledema due to AIDS. 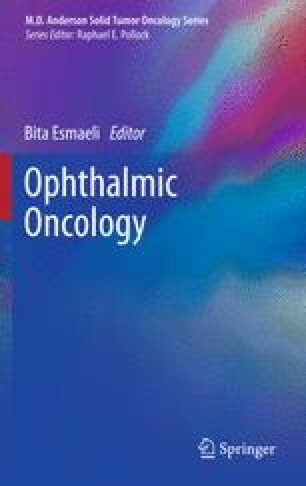 Indications for ONSF in cancer patients are not well established, but a few case reports have shown success of ONSF in patients with perineural metastasis of breast cancer, increased intracranial pressure with papilledema due to a brain tumor, lymphomatous infiltration of the optic nerve, and optic nerve sheath meningioma. ONSF can be performed with a medial orbitotomy approach with disinsertion of the medial rectus muscle, a superomedial eyelid crease incision without extraocular muscle disinsertion, a lateral orbitotomy approach with bone removal, or a lateral canthotomy incision without bone removal. ONSF is considered relatively safe when performed carefully; serious complications occur in about 1% of patients.